Clinton, Michigan - Eden Foods has again expanded its line of certified organic soymilks with NEW Organic Chocolate Edensoy. Chocolate Edensoy is made from Eden selected fair-trade, organically grown cocoa from the Dominican Republic in the Caribbean and finely milled in Holland. The best non-GEO organic soybeans, naturally malted organic barley and corn, and organic maple syrup create its smooth finish. The soybeans in Chocolate Edensoy are organically grown on family farms by those committed to a clean environment and the best tasting, most nutritious, safe food. Vital organic soil, the product of a dedicated network of 'Salt of the Earth' growers, produces the best tasting, most nutritious food while nurturing all life. Chocolate Edensoy is smooth, delicious, and nutritious. It is low in sodium, cholesterol free, low in saturated fat, and a good source of protein, potassium, iron, calcium, niacin, vitamin B6, folate, phosphorus, magnesium and copper. Chocolate Edensoy is a good source of soy protein, 8 grams per 8 ounce serving, exceeding the FDA requirements for lowering LDL (bad) cholesterol and reducing the risk of heart disease. Its protein comes from the whole bean rather than from isolates as in many other brands. Whole soy foods like Chocolate Edensoy with naturally occurring isoflavones may also help to ease menopausal symptoms, protect against certain kinds of cancer, relieve pain, and prevent osteoporosis. Chocolate Edensoy provides the added benefit of organic cocoa powder, a potent health food. Recent research has found that chocolate, especially cocoa powder, is rich in antioxidant flavonoids. As cited in Prevention Magazine (March 2003), research at Penn State University found that "People who ate a diet rich in cocoa powder and dark chocolate had lower oxidation levels of bad LDL cholesterol, higher blood antioxidant levels, and 4 percent higher levels of good HDL cholesterol." Joe Vinson, PhD, chemistry professor at University of Scranton says, "Think real cocoa ... Pure cocoa powder (not instant hot chocolate) has the most antioxidants, followed by dark chocolate, then milk chocolate." Cocoa has five and a half times more antioxidants than blueberries and 10.5 times more antioxidants than spinach. Chocolate Edensoy is also a source of the following essential fatty acids (EFAs): Linolenic (Omega 3) 260mg; Linoleic (Omega 6) 1730mg; and Oleic (Omega 9) 850mg per serving. Oleic (Omega 9) is particularly beneficial to heart health as it is a monounsaturated fatty acid which lowers LDL cholesterol without reducing HDL (good) cholesterol. Essential fatty acids are absolutely necessary for proper physical and mental health. Introduced July 1983, Edensoy was the first soymilk to be properly cooked for digestibility and nutrient absorption. The finest organic ingredients, reverse osmosis purified water, 240 continuous quality control checks, and years of research into how to best cook soy protein guarantees the best flavor, nutrition, and your satisfaction. Edensoy is the only brand that offers a full line of authentic organically grown and produced soymilks. Other soymilks are made at facilities that also process dairy milk, and have often been cited for containing undeclared dairy residue (casein). Commonly, other brands also contain undeclared isolated soy protein, flavor maskers and stabilizers, refined sugar (a.k.a. evaporated dried cane juice, brown sugar, high fructose corn syrup); and most are made with ingredients containing genetically engineered organisms (GEOs). Edensoy is simply the highest quality, is the most pure, and best affords peace of mind. Absolutely no shortcut is taken at any step in its creation. More Delicious, Most Nutritious. The Eden brand is your best assurance of freedom from genetically engineered organisms (GEOs) or their derivatives. A meticulous audit trail and tests at the farm, storage elevator, and maker guarantee the purity of Edensoy from seed to you. 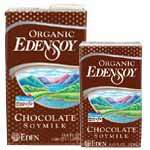 Chocolate Edensoy is certified organic, kosher and parve. Eden means no irradiation, no preservatives, no chemical additives, no food colorings, no refined sugars, no genetically engineered ingredients; just the safest, most nutritious, certified organically grown food that can be found. More than 260 Eden foods are available at discerning retailers in the U.S.A. and Canada. For more information, or if you would like our email for press releases, please call 800 248-0320, email us at cs@edenfoods.com or visit www.edenfoods.com. Retailers and Co-ops please go to access.edenfoods.com.